A compact disc (CD), or optical disc, is a thin, circular wafer of clear plastic and metal measuring 4.75 inches (120 centimeters) in diameter with a small hole in its center. CDs store different kinds of data or information: sound, text, or pictures (both still and moving). Computer data is stored on CDs in a format called CD-ROM (Compact Disc-Read Only Memory). All CDs and CD-ROMs are produced the same way. Digital data (the binary language of ones and zeroes common to all computers) is encoded onto a master disc, which is then used to create copies of itself. A laser burns small holes, or pits, into a microscopic layer of metal, usually aluminum. These pits correspond to the binary ones. Smooth areas of the disc untouched by the laser, called land, correspond to the binary zeros. After the laser has completed burning all the pits, the metal is coated with a protective layer. Audio or music CDs were introduced in 1982. They offered many advantages over phonograph records and audio tapes, including smaller size and better sound quality. By 1991, CDs had come to dominate the record industry. In an audio CD player, a small infrared laser shines upon the pits and land on the metal layer of the disc as the disc spins. Land reflects the laser light while pits do not. A mirror or prism between the laser and the disc picks up the reflected light and bounces it onto a photosensitive diode (an electronic device that is sensitive to light). The diode converts the light into a coded string of electrical impulses. The impulses are then transformed into waves for playback through stereo speakers. text, graphic (video), or sound information. Discs that contain information in more than one of these media are referred to as multimedia. Since video and sound require large amounts of disc storage space, most multimedia CD-ROMs are text-based with some video or sound features added. 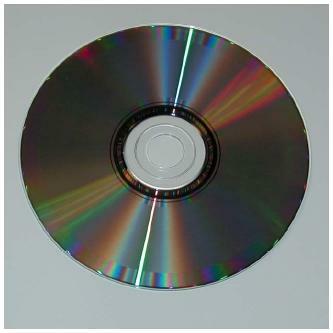 Information on a CD-ROM is retrieved the same way it is on an audio CD: a laser beam scans tracks of microscopic holes on a rotating disc, eventually converting the information into the proper medium. Because of their high information storage capacity, CD-ROMs have become the standard format for such large published works as software documentation and encyclopedias. WORM (Write Once, Read Many) systems are a little more complicated than CD-ROM systems. Writable WORM discs are made of different material than consumer CD-ROMs. When a WORM disc is created, a laser does not burn pits into a microscopic layer of metal as with a CD-ROM. Instead, in a heat-sensitive film a laser creates distortions that reflect light. These distortions represent bits of data. To read the disc, the laser is scanned over the surface at lower power. A detector then reads and decodes the distortions to obtain the original signal. WORM discs allow the user to write new information onto the optical disc. Multiple writing sessions may be needed to fill the disc. Once recorded, however, the data is permanent. It cannot be rewritten or erased. WORM discs are especially suited to huge databases (like those used by banks, insurance companies, and government offices) where information might expand but not change. Magneto-optical discs (MODs) are rewritable, and operate differently than either ROM or WORM disc. Data is not recorded as distortions of a heat-sensitive layer within the disc. Rather, it is written using combined magnetic and optical techniques. Digital data (binary ones and zeros) is encoded in the optical signal from the laser in the usual manner. Unlike the ROM or WORM discs, however, the MOD write layer is magnetically sensitive. An external magnet located on the write/read head aligns the binary ones and zeros in different directions. The MOD is read by scanning a laser over the spinning disc and evaluating the different directions of the digital data. The MOD is erased by orienting the external magnet so that digital zeros are recorded over the whole disc. Compact Discs are very interesting! Thank you to whoever put up this information for the rest of us to enjoy.